Over the last fifteen years, Urban Initiatives’ Work to Play program has grown from 12 students to 1,350 students in 44 Chicago Public Schools. Coinciding with this incredible growth is the increasing costs of transportation for our participants and their families. Busing remains a critical portion of our programming and mission. 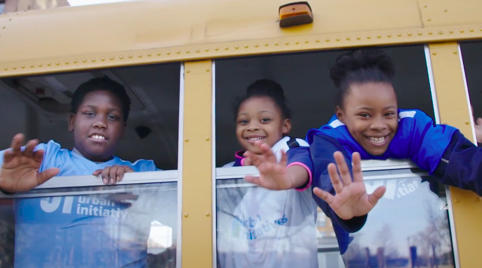 In order to continue to provide students with the opportunity to travel with their Work to Play team, the Urban Initiatives Bus Campaign—a yearly crowdfunding campaign spearheaded by our Associate Board—raises crucial funds to offset the costs of transporting students to game days and field trips. Urban Initiatives’ buses travel to a variety of events critical to our program and mission. In the Work to Play program, our participants travel to play soccer with teams in communities throughout the city—crossing gang, cultural and racial boundaries to come together through a common love of sport. These field trip experiences are vital to enhancing our program participants’ social and emotional development as well as meeting our overall programmatic goals. Urban Initiatives utilizes the inherent power of sport—which builds leadership skills, empathy, respect, cooperation, and commitment in young people—and unifies diverse stakeholders to support our youth. Due to segregation and siloed communities, it is through busing that Urban Initiatives makes good on our promise to unify these diverse stakeholders to build a stronger, smarter, and safer city for our participants. Busing is a critical portion of Urban Initiatives programming, as it provides diverse cultural and educational experiences to our participants. When our participants are on the bus with their teammates they get to experience new parts of Chicago. In fact, for some our students from the far west and south sides, a bus ride with Urban Initiatives may provide their first glimpse of Lake Michigan. In the communities we serve, youth rarely travel outside of their neighborhoods; thus, homogeneous populations often define student experiences. While Chicago is an incredibly diverse city—among the most diverse in the nation—it is among the least integrated cities in the nation. Index of dissimilarity is a metric that describes the relative separation or integration of groups across all neighborhoods of a city. Chicago’s index of dissimilarity is 72%, among the highest in the nation.1 One of the many impacts of this segregation is that Chicago youth grow up in segregated, siloed communities, without access to the rich diversity that the city has to offer. Urban Initiatives aims to enhance social inclusion across Chicago by exposing children to new people, places, and ideas. Coach Omari, from King Elementary in Englewood summarized the critical need for busing, “Through the busing that we receive from Urban Initiatives, we are able to expose our students from Englewood to neighborhoods in different parts of the city. Whether its north side, west side, or a next-door neighborhood to Englewood, it’s only through this available transportation that we continue to be able to bring all these diverse children together!” These new experiences introduce Urban Initiatives participants to otherwise unfamiliar neighborhoods and begin to create a sense of community across neighborhood lines as our students meet to share a game of soccer. Coach Rosa, of Jordan Elementary Community School in the Rogers Park neighborhood, describes the importance of busing as being not only a way to build common experiences across teams but notes that busing is also important, “because traveling as a team creates unity.” Programs like ours have become increasingly vital in Chicago, where gang violence continues to rise. Research shows the biggest factor in whether someone entered a gang or not was having an identity around something.2 Chicago Public Schools do not offer any sports programs to students in kindergarten through fourth grade—years formative for young students creating their sense of identity. Meanwhile, in Chicago, gang recruitment begins when students are in second to fourth grade. Work to Play, which serves students kindergarten through fourth grade, provides a critically important outlet for young Chicago students to develop a sense of belonging, and it serves as an alternative option for young people who may otherwise take a very different path. Bus rides and games days are an opportunity to build team unity and enhance the feeling of belonging that students experience as a part of the Work to Play team at their school. It’s not just UI participants that have the opportunity to ride the bus: for each game day, Urban Initiatives invites parents and siblings of team members to ride the bus as well. Coach Ella is the On-Site Program Director at one of the northernmost schools served by Urban Initiatives and she notes that, “some kids come from families that don’t have a car and barely get out of their neighborhood. It’s amazing to hear them ooh and ahh at the houses and different sites they see on our way to a game day!” We have a lot of parents who are heavily involved in Urban Initiatives’ programming and love the opportunity to ride the buses with their children. For Urban Initiatives, this allows us the time to get to know our families and integrate them into our programming to better support their child. Research has found that parent engagement positively impacts children in several ways. For instance, when parents are engaged in their child’s education through activities such as school involvement and teacher interaction, children are more likely to perform well in school.3 Urban Initiatives coaches are teachers at the schools they serve, so building a relationship with the Work to Play coach on the bus and at game day can help parents build connections to the school that will ultimately enhance the likelihood of their students’ academic success. Additionally, parent engagement has been found to mitigate the effects of violence exposure for urban minority youth. 4 Riding the bus is a great way for parents to get involved in Urban Initiatives programming to create shared experiences with their child and build a sense of community within the team and the school. Urban Initiatives serves 38 vibrant Chicago communities, but so many of these communities and their residents remained siloed throughout the city. By creating opportunities for cross-community game days and events, we are helping our future community leaders learn from their peers and from positive adult role models across the city. The shared experiences of game days are foundational to our Work to Play program and allow Urban Initiatives to make good on our commitment to using sport as a tool to unify diverse communities. The Bus Campaign this year aims to raise $80,000 to provide busing for every student in Urban Initiatives programming. You can support the campaign by clicking here. Luhby, Tami. “Chicago: America’s Most Segregated City.” CNN Money, Cable News Network, 5 Jan. 2016. Barnard, 2004; Fan & Chen, 2001; Feuerstein, 2000; Jeynes, 2003; McWayne, Hampton, Fantuzzo, Cohen, & Sekino, 2004. Previous Article: Chicago Blackhawks Foundation Scores for UI!